I saw this wreath technique done by Yana Smakula from Simon Says Stamp and had to try it myself! Just lay your stamps out in the pattern you want on a separate piece of paper the same size as your card, and then freehand stamp them individually onto your cardstock, building as you go. Stamp your greeting in the middle of the card first and then build your floral wreath around it. Mine is a fairly simple design and was not difficult at all. Actually the hardest part of the process is deciding what stamps you want to use and the colors of your flowers! My card is a standard 5-1/2 x 4-1/4 inch card in white, top folding. Everything is one layer! 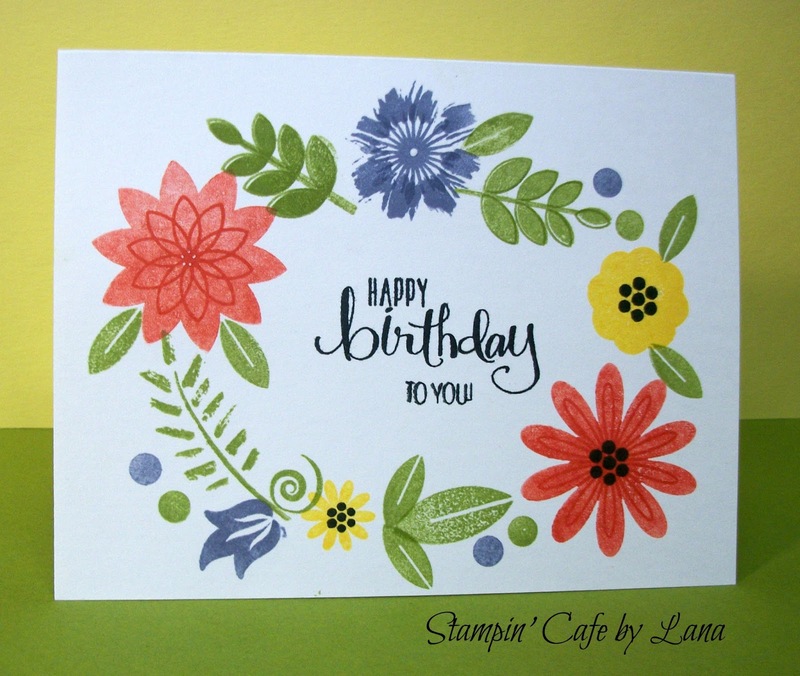 The colors I chose are Calypso Coral, Pear Pizzaz, Daffodil Delight, and Wisteria Wonder, all from Stampin' Up. The stamp sets I used are "In Bloom: Eva's Favorite Flowers" by Winnie & Walter, and purchased from Catherine Pooler Stamps; a Paper Pumpkin stamp set called "Celebrate Everything," and a Paper Pumpkin stamp set called "Hello Sunshine."